SEAFARERS INFO - Available seafarers jobs, seaman direct hire, seaman job vacancy 2019, domestic seaman hiring, urgent job hiring for seaman joint on Container, Car Carrier, Bulk Carrier, Oil Tanker Vessels. 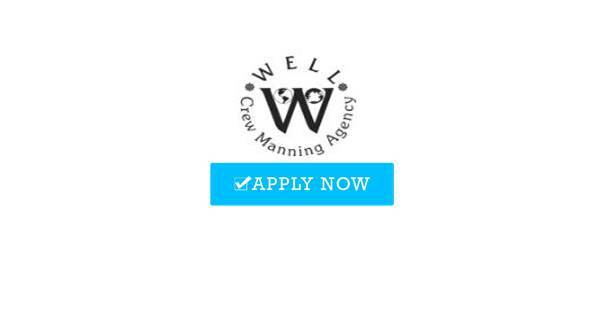 WELL Co. Ltd. is Crew Manning Agency, which selects, recruits and delivers seafarers to its Clients (ship owners and ship managing/ crew managing companies). We are a reputable Company based in Latvia, established by our eternal leader & owner Mr.Vladimir Bogdanov. The Company has been successfully engaged in crewing business on the international market since 1992. We are licensed by Latvian Ministry of Transport and prove our appropriateness on an annual basis by effectually undergoing inspections & audits. Our company has implemented and developed a Quality Management System, which has been certified by the world's leading classification & inspection authority, Lloyd's Register Quality Assurance. As of 1996 an agreement was signed between WELL Co and Zodiac Maritime Limited (London). In 2001 the company signed an agreement with Tanker Pacific Management, which was renamed to Eastern Pacific Shipping Pte. Ltd. (Singapore) in 2013. We are proud to provide our services and to be the official representatives of the aforementioned Companies in the Baltic States & Russia. In addition, we have a strong business relationship with the reputable & recognized shipping companies: Centuria Marine Services GmbH & Co. KG. (Germany), Chemtrans Crew management GmbH (Germany), Cymare Shipmanagement Ltd.(Cyprus), Triton Schiffahrts GmbH (Germany) and NSB Niederelbe Schiffahrtsgesellschaft mbH & Co. KG (Reederei NSB). 45/47 Elizabetes str., 6th Floor, Riga, Latvia LV 1010. 0 Response to "Need Officers | Engineers For Container, Car Carrier, Bulk, Oil Tanker Vessels (Worldwide Jobs)"